Chris Bartolomei, interim chief of police (left) and Mark Coldren, chair of the chief of police search committee (right) talk during a community forum Wednesday. Bartolomei is one of three candidates being considered for the position. The other two candidates will speak at forums on Thursday and Friday. University Police are holding forums this week, where three chief of police candidates will present their visions to the UB community. A search committee comprised of five university administrators started a national search for candidates in September. UPD formed the committee after the previous chief, Gerald Schoenle Jr., retired in January. UPD is holding three days of community forums for each candidate to discuss their goals for the department and explain why they’re a good fit for the position. During each day, one of the candidates will present three times to members of the community who are interested in learning about their proposals. The first candidate, Chris Bartolomei, the current interim chief of police and only internal candidate, presented on Wednesday before two others present Thursday and Friday. During his 11 months as interim chief, Bartolomei said he felt withdrawn from students and campus life. 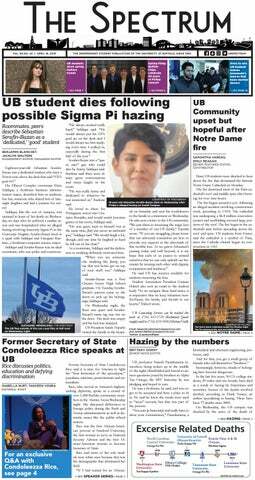 He said as chief, he would try to build one-on-one relationships with students in order to establish a better overall connection to the UB community. Attendees of the forum said they were impressed with Bartolomei’s 22 years of experience working for the university, the last year of which he has acted as the chief of police. Aaron Maracle, assistant violence prevention specialist at UB, said he was glad to hear Bartolomei’s proposals for increasing interaction with students. Doris Corley was also optimistic about Bartolomei’s initiatives for increasing connections with the community. Corley, senior legislative assistant to council member Rasheed Wyatt, said it would be nice to see a chief of police who attended community police forums in order to be better connected to our surrounding areas. The two remaining candidates –– whose names cannot be released until they speak, according to committee chair Mark Coldren –– will present their proposals Thursday and Friday.